As fusion propulsion is still a long way away, one might wonder what ITER and Airbus have in common. In fact, a lot. Like ITER, the European aeronautics consortium is based on international cooperation and shared procurement. And—although building tokamak is much more complex than building an aircraft—the viability of both endeavours long term depends on strong program management and robust industrial partnerships. Hubert Mantel, head of the Centre of Competency Project and Programme Management at Airbus, was invited to speak at ITER in the framework of the Inside ITER lecture series—an enrichment program open to all ITER employees. At the beginning of his Inside ITER presentation on 3 February, Airbus's Hubert Mantel had a few powerful statistics for his audience. Air traffic is doubling every 15 years. An Airbus takes off or lands in the world every two seconds. And there is a nine-year backlog on orders at Airbus (with a similar situation at rival Boeing). "We turn out approximately 60 aircraft per month, and if we could produce more we could sell them," he says. "In such a strong market, we know the two historical operators will eventually be challenged. We need to prepare ourselves now for the arrival of new competition." How to go about refining the processes and methods that define a company to ensure maximum competitiveness? In a company as large as Airbus—employing 55,000 people in civilian aeronautics alone and producing at 11 different sites—it's all about managing complexity. In his presentation to a packed ITER amphitheatre titled "How to tame a 'monster' project: change for the better," Hubert Mantel returned to a key moment in Airbus history when the decision was made to invest heavily in project and program management. The decision was born from a crisis. 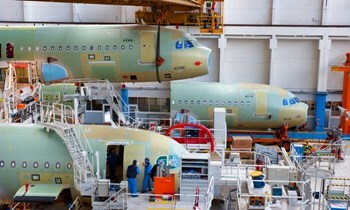 The development of the giant A380—the most complex development program for Airbus to date—had run grossly over budget and schedule between 1995 and its first flight in 2005. "The situation had enormous consequences throughout the company and we knew, at all levels of the organization, that we couldn't survive a situation like that twice." Did it mean that Airbus was bad at the job it was doing? "Not at all; we had the technology, the talent, and the supply chain," stresses Hubert. "But we needed to improve the way that our projects were managed." With strong support from top management, a project management centre, called the Centre of Competency, was created to promote the best practices throughout the organization. "We were facing the development of a new aircraft, the A350, we knew we couldn't repeat the errors of the A380," recounts Hubert. The Centre of Competency team (approximately 25 full-time staff) started by building the foundations of a new project management culture—in all, it was a two-year effort to improve documentation, processes, methods and tools used throughout the company. Hubert likes to think back at that time as "the easy part." "We looked into lessons learned from past experiences and thought carefully about what had to change so that the same mistakes wouldn't be repeated," says Hubert. He gave one example of a "never again" situation, in which the design and production of a small A380 component (harnesses) had been carried out at different centres in France, Germany and UK with different design tools. "You've probably guessed it—in the end the components couldn't connect during assembly and armies of people had to work day and night to correct the fact that integration wasn't properly done." After the initial "foundation" phase, the team began working to diffuse good practice throughout the organization. "That's the hard part. It's all about training behaviour, and getting people to adopt tools that may not be familiar to them," says Hubert. "At Airbus, it is happening progressively. We still need to enrol the supply chain, where there are variable degrees of experience with project and program management. For the scale of change in project culture that we are attempting, we know it will take at least a decade to implement." Hubert cites two key factors that have contributed to the success of the program at Airbus, which is credited with positively affecting the development of another aircraft, the A350, as well as company earnings since 2010. "We introduced that program during a moment of true crisis—a time when real need was felt throughout the organization and supported at all levels. And top management was on board from the beginning, with the attitude: we will succeed at this program."